The AE Dor Coffret Degustation Tasting Set is a beautifully presented combination of four different qualities of Cognac from this artisan producer. 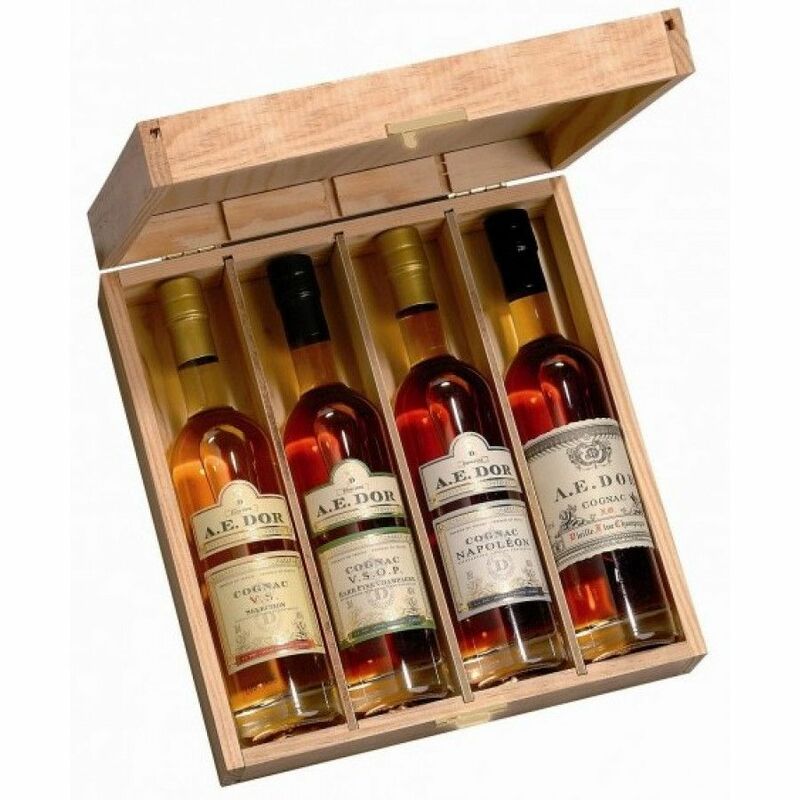 Consisting of 4 x 20cl bottles set in a delightfully simple wooden presentation box, this is a wonderful product to discover the range of AE Dor Cognac. It would also be a great choice as a gift to any Cognac lover. A blend of Borderies and Fins Bois eaux-de-vie, this young Cognac is floral, fruity, with the scent of summer flowers tinged with the sweetness of honey. On the palate it offers a tuned finess, with good maturity for such a young blend. This blend of Grande Champagne and Petite Champagne eaux-de-vie is a wonderful example of a VSOP quality. On the nose it delights with generous floral and violet tones, and is delicate and smooth on the palate. If also has a surprisingly long finish for its age. This well-rounded Cognac is a blend of three different growth areas of the region: Grande Champagne, Petite Champagne, and Borderies. And it certainly works! The finesse and length of Grande Champagne is complemented by the maturity of Petite Champagne. Add in the vigor and vivacity of that which comes from the Borderies, and you have a finished product that teases and titivates each and every one of the senses. From it's deep color to the spicy, vanilla aromas, through to the mellow, ever-evolving tastes on the palate, it then reaches its finale in a long, satisfying finish. The oldest Cognac in this tasting set, this blend of Grande Champagne and Petite Champagne is one loved by connoisseurs the world over. And with good reason... It's an elegant, delicate offering that provides the taster with a complex, yet well-balanced journey, from the nose right through to the lengthy finish. Delight in the flowery tones, honey, aromas, and taste of vine canes. This is certainly one to savor - the perfect end to a fine dining experience.